In south-east Asia, amidst the jungles of Cambodia, lie some of the most impressive cultural sites in the world. The temple complex Angkor, which has been in the UNESCO World Heritage List since 1992, captivates visitors with its majestic dimensions and wide variety of art forms. From the 9th till the 14th century, Cambodia was the heart of high Khmer culture. The largest and most important temple in the area is Angkor Wat. Its surfaces are decorated with unique stone sculptures, including almost 1850 divinities (known locally as „apsaras“), bas-reliefs up to 100m long in the galleries and richly-decorated tympanums which look as though they have been carved from wood. These latter, however, are in a worrying condition; many have already fallen victim to the weather. Since 1995 a team from Cologne University of Applied Sciences has been working to prevent further decay. The restoration and conservation measures are being carried out by lecturers and students from the Institute of Restoration and Conservation Science in cooperation with a team of Cambodian conservators. The project also receives support from external scientists in the fields of geology, geomicrobiology and chemistry. Every natural stone has its own characteristic properties; each one reacts differently to the effects of the weather. Since 1995, therefore, the sandstone blocks used to build Angkor and the damage already caused have been the subject of detailed investigation so that decisions can be taken on the most suitable conservation methods. Every situation, every temple, is considered individually, and all steps in the process must be documented in detail. A thorough survey revealed that about 300 apsaras and a large number of reliefs on the pediments of Angkor Wat were so badly damaged that large pieces of stone could fall off at any time. Since 1998 the weather-beaten reliefs have been undergoing painstaking conservation. However, it will not be possible to prevent further damage completely. Continual monitoring and maintenance will be needed. 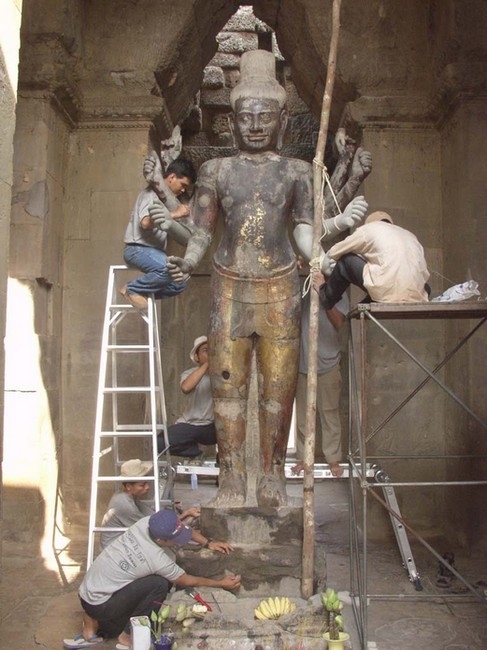 The German Apsara Conservation Project (GACP) began in 2003 with an examination of further temples in Angkor Park, including the early brick temples with their amazing stucco decorations. On the basis of the findings, conservation measures were successfully carried out. In 2006 work extended also to Koh Ker temple, north-east of Angkor. In 2008 work began on the derelict remains of Preah Khan Kampong Svay. If the work is to be successful, the workers must undergo constant training. As part of the project, the GACP trained the Cambodian conservators. Students from Cologne University of Applied Sciences and other universities can help with project work during their practical semester or help with dissertations. Playing a part in a major scientific research project on a UNESCO World Heritage site is a unique opportunity for the students. The history of the northern Iraqi city of Erbil spans more than five millennia. The citadel hill, a World Cultural Heritage site since 2014, and two historic commercial buildings at the foot of the citadel – the Ottoman Qaisariyas – bear witness to this history. The landscape of the capital of Kurdistan Province is chiefly dominated by more recent history. 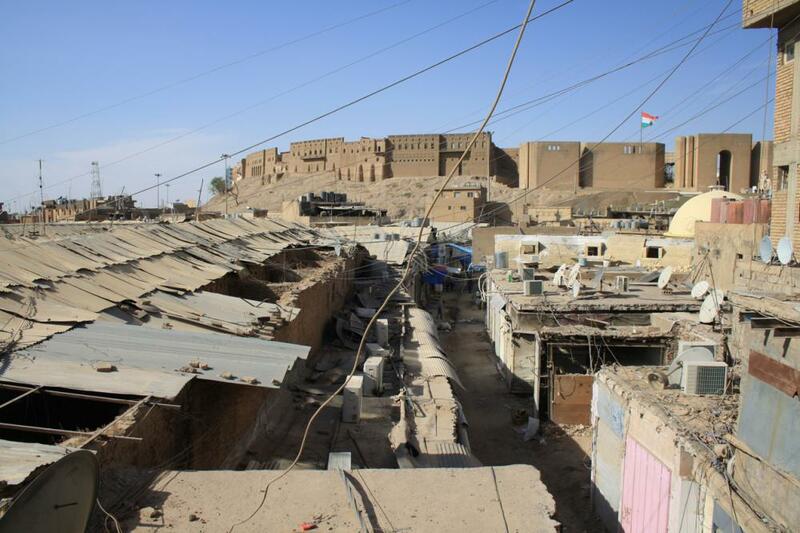 A large amount of historical fabric dating from between the 18th and the 20th centuries has been preserved in the area of the citadel, in the traditional residential districts to the immediate south and in the Bazaar. It is under acute threat from the widespread desire for construction and modernisation in the area. 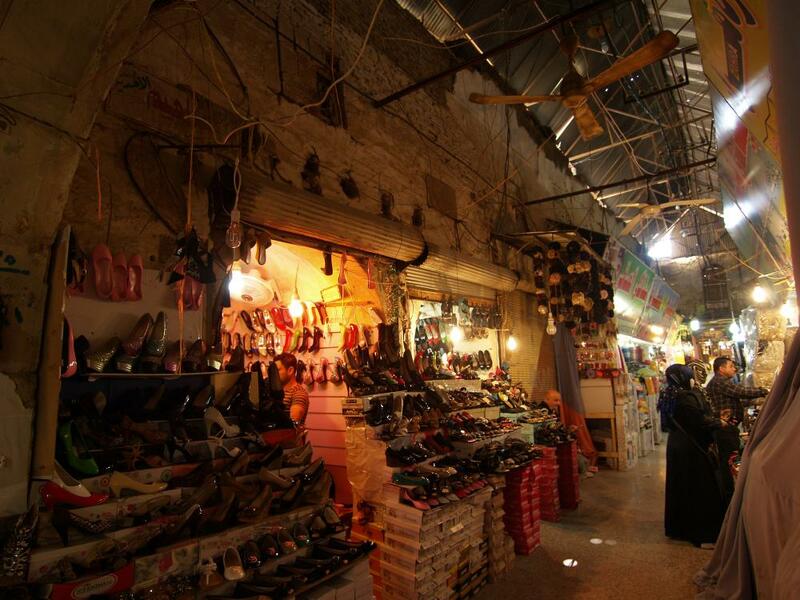 The historical buildings located in the Bazaar area are two Qaisariyas, separate, roofed commercial buildings which were erected in the late 19th century by a family of wealthy long-distance merchants for the sale and storage of high-quality goods. In their position at the centre of the Bazaar, embedded between the main north-south traffic arteries, they form architectural points of Reference between the urban landmarks of the citadel and the mosque in the southern area of the Bazaar. 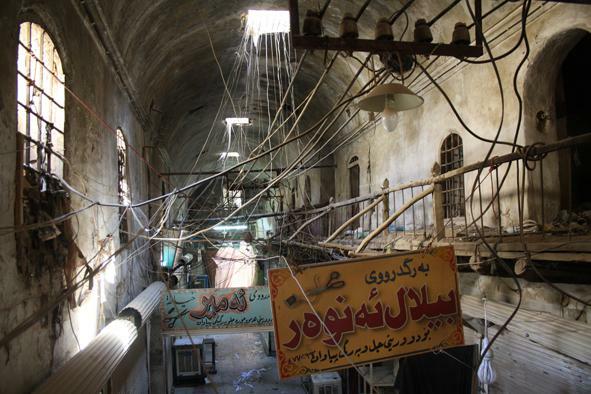 Within the structural fabric of the Bazaar district the two-storey buildings, closed to the outside, stand out clearly from the surrounding structures with their identical shop units and barrel-vaulted walkways. This self-contained nature of the buildings is currently barely recognisable due to subsequent installations and structural damage. The Qaisariyas have historical significance as a regional form of commercial building. They reflect the importance of Upper Mesopotamia as a place of interaction between Iran, southern Iraq, Anatolia and Syria. 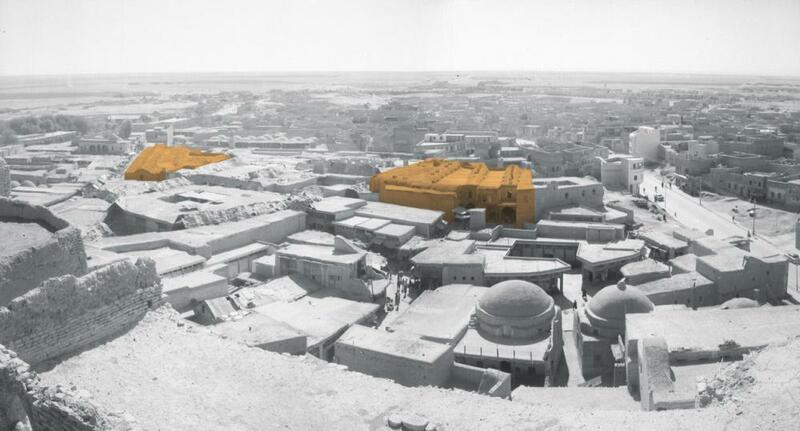 Their conservation will help preserve Erbil’s historical identity as part of this heterogeneous region. In their current state the Qaisariyas are under acute threat. To save the buildings, which are of great historical and architectural importance, a detailed building survey and damage analysis were performed and a restoration plan complying with preservation standards developed as part of a cooperation project run by the Kurdistan Department of Antiquities together with the TU Berlin and the German Archaeological Institute. In addition, conservation and restoration work was carried out on selected pilot sections of both buildings. Restoration of the entire structure in line with the monument preservation concept is to be implemented by the Kurdistan Regional Government. 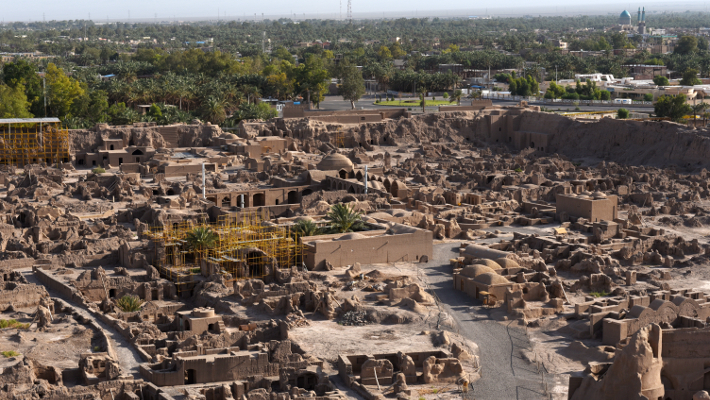 The Bam Citadel in south-eastern Iran is the world’s largest clay-built complex, with a history spanning more than 2500 years. On 26 December 2003 the Citadel was almost completely destroyed by an earthquake. Large parts of one of the central buildings in the Citadel, the Sistani House, which dates back to the late 18th century, also collapsed. 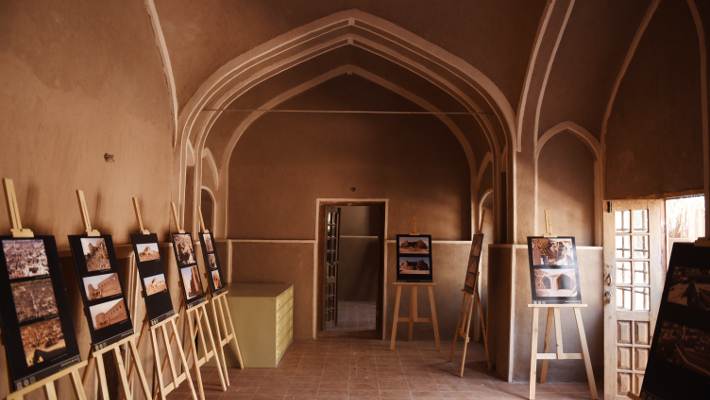 Since 2007 the Cultural Preservation Programme of the Federal Foreign Office has been promoting the project to reconstruct the Sistani House, incorporating the existing ruins to bear witness to its architectural and cultural history, and is thus supporting the efforts of the Iranian Cultural Heritage, Handicrafts and Tourism Organisation (ICHHTO) and UNESCO to preserve and maintain the Citadel. A team from the TU Dresden submitted proposals for restoring and rebuilding the Sistani House which, as well as reconstructing destroyed sections in keeping with the original, placed an emphasis on preserving key parts of the ruins as a testimony to the past and incorporated preventive measures to minimise earthquake damage. Subsequent restoration and reconstruction projects in the Citadel also included subtle but effective improvements in the clay buildings’ earthquake resistance. 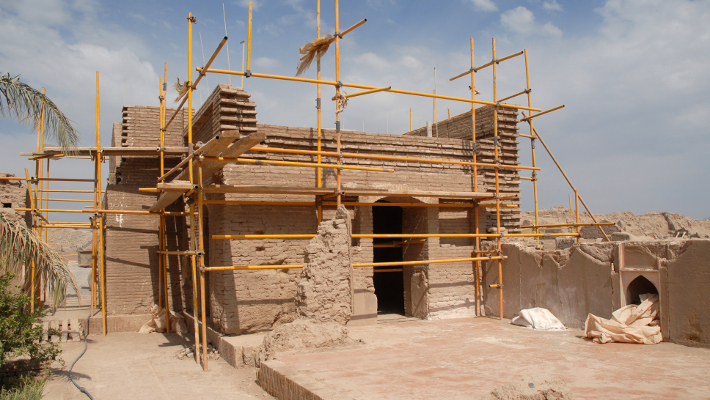 In the case of the Sistani House, this was achieved by reinforcement of the clay bricks with date palm fibres, vertical anchoring as well as the use of ring anchors and installation of tension elements into the horizontal joints. Comprehensive theoretical investigations and practical experiments formed the basis for the measures, which drew on the latest scientific findings as well as improved technologies adapted to the task in hand. The project involves a significant degree of knowledge transfer. As well as the technologies, the methods and planning, ranging from the archaeological rubble clearance, through the drafting and approval stages, up to the working drawings and construction supervision, are to serve as a model for how to proceed in the case of valuable cultural structures. The project was realised through several annual campaigns in which Germany was responsible for the planning and the technical and technological requirements as well as implementation of the injection grouting and anchoring work. The Iranian Cultural Heritage Organisation then performed the rest of the reconstruction work, guided and supervised by Germany. Completion and full re-use is scheduled for 2015. Over the course of the project a good working relationship with the Iranian Cultural Heritage Organisation ICHHTO has been established and maintained, in which both sides have complemented and supported each other. In the past years the project has therefore also shown Iranians that international cooperation is viable and effective. Between 1818 and 1824, King Anouvong had a monastic complex built in Vientiane which has weathered all that history has thrown at it. The oldest construction in the city, it is now a national memorial and museum housing the largest and most significant collection of 15th to 19th-century Buddhist sculpture and what are probably the oldest murals in the Lao People’s Democratic Republic. Only a few years after the monastic complex was completed, two Siamese invasions left the city of Vientiane almost razed to the ground. Vat Sisaket alone was spared. King Anouvong had attacked Siam in a bid to secure the independence of his kingdom. He and his family were publicly put to death in Bangkok, and the people of Vientiane were deported to Bangkok and neighbouring Siamese regions for forced labour. It was not until the French colonisation of Laos, from 1893 onwards, that the city began to recover. Vat Sisaket, still home to monks while Vientiane had lain deserted around it for nearly 70 years, was restored for the first time in 1896. More restoration work was to follow. Interior of the temple in March 2015 following initial restoration (on the right). © Andrea Teufel/GEKE e.V. In the sim, the temple and heart of the complex, 400m2 of murals from five different periods can be seen today. They depict adventures from the life of Prince Pookkharabat as told in the Balasankhya Jataka, alongside decorative floral compositions. Created between 1820 and 1960, they are a unique testament to the changing style of Lao Buddhist mural painting. Today, their condition is characterised by earlier structural damage, rising damp and salt deposits in the walls, crumbling plaster, peeling layers of paint and stubborn accumulations of dirt. There used to be murals in the cloister which surrounds the temple, but they have been almost completely destroyed. Produced in part using unsuitable materials and protected only by a roof, they proved unable to withstand the tropical climate over time. Work to comprehensively restore the buildings began in 2011. Something urgently needed to be done, but the expertise required for the extremely complicated conservation and restoration of the temple and cloister murals was unavailable in Laos; this prompted Germany’s Federal Foreign Office to release cultural heritage funds for the project. Not only can the murals now be preserved, but Lao artists have an opportunity for further training too. Extensive assessments were carried out and a conservation and restoration plan drawn up in cooperation with the Heritage Department of the Lao Culture Ministry. An international team started putting that plan into practice in 2014. A sample in the cloister shows what the original painted decoration was like. In the temple itself, the many visitors can already marvel at the first results of the mural restoration. 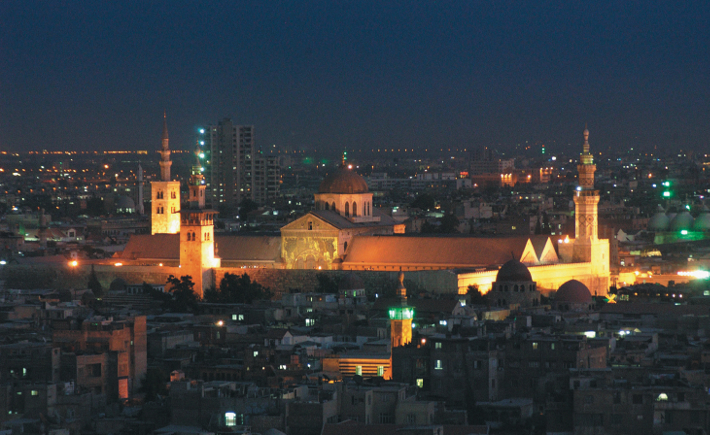 The civil war in Syria poses an acute threat to the country’s cultural heritage. 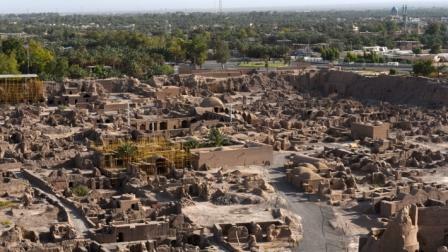 Thoughtless and wilful destruction and robberies are documented daily, and it is not rare for World Heritage sites to be affected. The Syrian Heritage Archive Project is designed to counter the loss of these unique historical treasures. Syria has an outstanding, millennia-old cultural heritage. The country’s social fabric is still characterised by extraordinary ethnic and religious diversity. The cultural archive of collective memory is of vital importance not only for Syria but for the whole of humanity. This is precisely why cultural sites in Syria were among the first to be recognised by UNESCO as World Heritage sites. 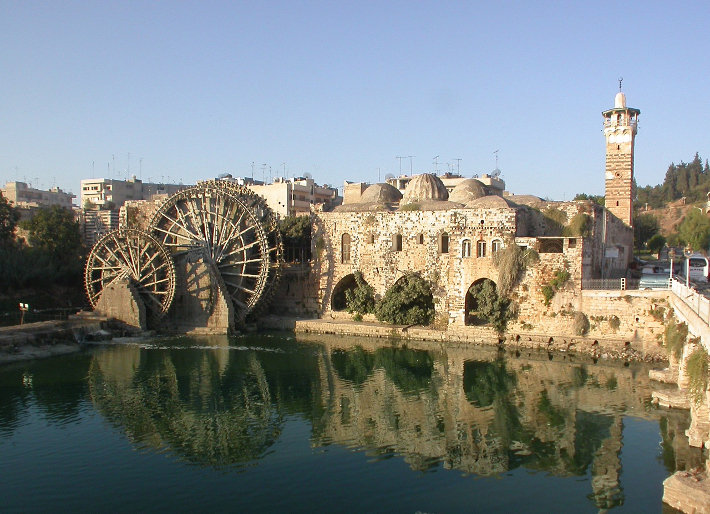 To counter the risk of losing for ever entire cultural landscapes with their archaeological and historic monuments, the Syrian Heritage Archive Project was launched in 2013 with funding from the Cultural Preservation Programme of the Federal Foreign Office. 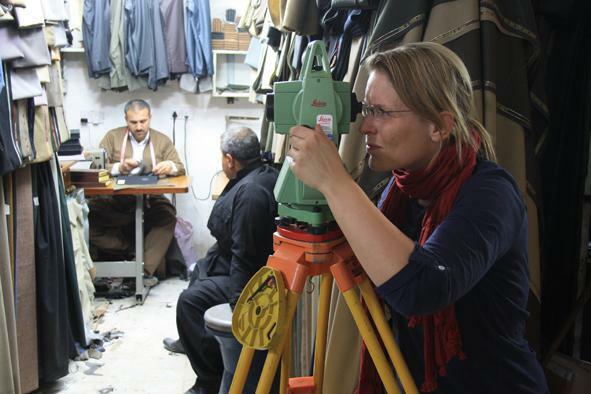 Two German academic institutions with many years of experience of research in and into Syria – the German Archaeological Institute (DAI) and the Museum of Islamic Art in Berlin – are playing their part in the internationally coordinated efforts to preserve Syria’s cultural heritage. Many institutions around the world hold comprehensive analogue documentation on Syria’s archaeological and historic sites and monuments generated over decades of joint research activity in Syria. 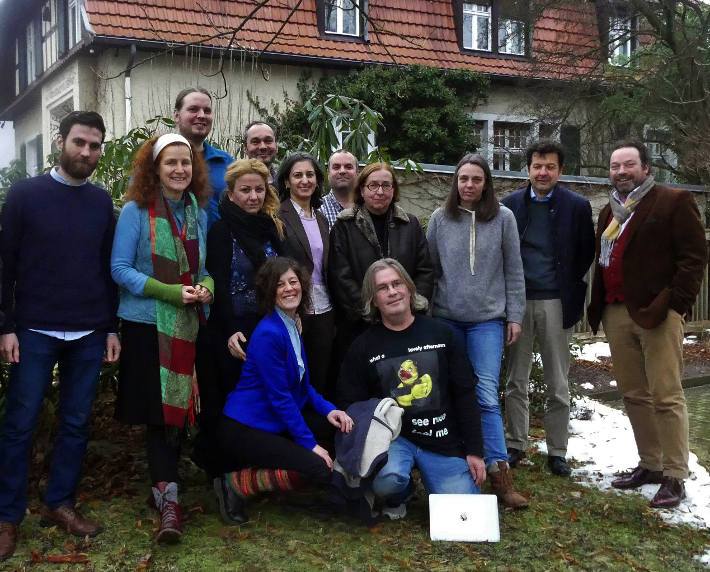 However, there is as yet no adequate digital record of this information, which is why the project seeks to compile a digital record of the archaeological research data available in Germany. These include a host of texts, plans and images relating to almost all the country’s major ruins and historic old towns. The aim is to create a solid database for a digital register of cultural sites which will, for instance, be the basis for monitoring with regard to the illegal trade in antiquities, and which will be crucial for the post-war reconstruction of destroyed archaeological sites and historic monuments. Around 127,000 data sets of country-specific material were collated in the 2013 and 2014 project phases. This enormous source of information from very different media is being archived using various iDAI. welt data processing systems, collated in a structured form as a treasure trove of information on Syria’s cultural heritage and prepared for later use. 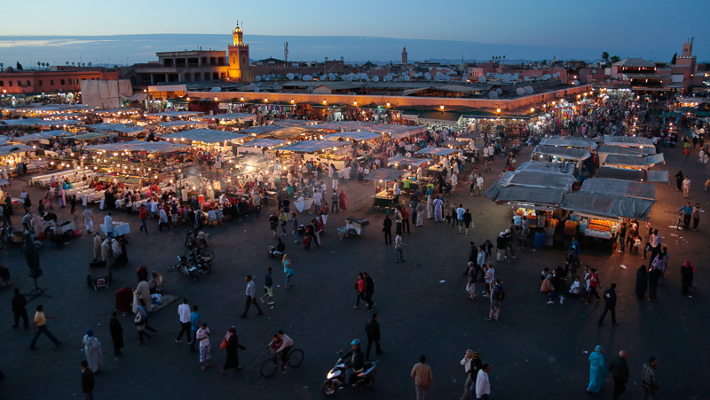 Every day, locals and travellers, the curious and the leisurely gather in Jemaa el Fna in Marrakech and let the performing arts of the Hlaiqi, the dancers, singers, acrobats and storytellers, wow them in this thousand-year-old town square. The richness and diversity of cultures are manifested not just in outstanding writings, images, archaeological sites and architectural spaces but also in much more transient dynamic forms of expression like music, dance, song and oral narrative. A vast range of different strands of vibrant intangible arts (acrobatics, dance, song, recitation, conjuring, fortune-telling) come together in Jemaa el Fna, this large, extremely animated square – “Hanged Man’s Square”; it is a real point of confluence, concentrating the oral and performance traditions that used to be spread throughout Morocco. They have remained in place here longer than anywhere, relatively unbroken. This is a patchwork of living traditions which today are rightly counted among the intangible cultural heritage of humanity as recognised by UNESCO. The spatial distribution of spectators and artists, the ring or circle that the curious and the leisurely join around the nucleus of the performances, is known as the Halqa. Al Halqa Virtual, the Jemaa el Fna virtual museum, transforms these performances through the medium of film, audio and writing, giving them a more lasting presence and making it possible to experience them in new ways. This online platform gives the performances – and, in a way, the square itself – accessibility beyond the limitations of time and space. At the same time, the virtual museum evokes memories of a circus tradition that used to have its place in a similarly heterogeneous form in central Europe too. The presence of these artists gives an idea of how far our culture has moved away from these arts. Information about the various Halqas is available via a browser-based platform. Translated extracts from films and audio files create a kind of virtual tour of the square. Visitors are shown a glimpse behind the scenes of the performative experience to highlight the significance of the intangible arts to the culture of Morocco and of humanity.